Therapies, specially the external therapies are an integral part of the Comprehensive Ayurveda Care. With the growing trend of globalization and wider acceptance of Ayurveda across the globe, these therapies have come under the limelight. Unlike olden days, today the awareness about different safety and hygiene issues has made the Ayurveda care industry rethink the therapy delivery system. The direct human to human contact makes it crucial for the vaidya/service provider to ensure the safety of the patient as well as the therapist from any allergic reactions or contagious diseases. The Book Ayurveda Therapy Practices is a unique and significant step in the standardization of Ayurveda therapies specially Keralīya pañcakarma therapies for any Ayurveda therapy center (ATC). Two renowned personalities viz., Dr. P.R. Krishna Kumar and David Frawley have respectively written the preface and foreword for the book. The book is divided into three segments named as Parts 1, 2 and 3. Part 1 details the procedures and contains 29 chapters, Part 2 describes the resources and research and contains four chapters and the Part 3 composes of eight annexures. The 29 chapters of Part 1 describe the protocols and responsibilities for each treatment procedures, starting with abhyaṅgam in chapter 2. Interestingly, thefirst chapter is dedicated to common hygiene practices to be followed in the ATCs. The recommendations are apt and make an elegant introduction to the subject. This is also an important step to make any ATC a world class therapy center. The second chapter starts with abhyaṅgam (which is the most basic among all therapies), and continues with the other therapies. The chapters have been given organized into headings such as: Purpose, need, scope, definition, references, therapy, pre examinations, duties, preparation of therapy room, materials required, steps for main therapy, post therapy practices, general information including benefits, indications, contraindications, etc., and is designed to aid better comprehension. The different headings and subheadings are organized under numbering, which makes the content simple and easy to follow. The minute guidelines on the appearance and behavior of the therapist are significant. The chapters also give recommendations about the oils used according to different conditions. 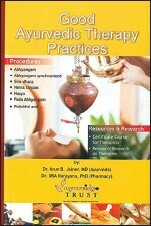 Photographs of the therapies have been added in a few chapters, to aid visual understanding of the therapy. Svedana using a steam chamber is discussed as part of the post abhyaṅga protocol, which always is not necessary. Svedana itself may be treated as an individual therapy. The matter and the photographs are repeated in many places, although increasing the bulk of the book, actually helps avoid confusion when one needs to refer the book for the protocols of only one therapy. Part 2 starts with a thought provoking chapter on the role of paricāraka in Ayurveda and defining his importance. The authors have raised the issue that during the evolution of Ayurveda, this segment seems to have been neglected and proper training is either not given or such courses are in scarcity. The next chapter recommends a structure of a certificate course for pañcakarma assistant with three modules and a detailed syllabus with the required duration. The next chapter comes up with the guidelines for the qualification of a therapist by grading them into Level A, B and C. The last chapter of this part deals with the short review of research on pañcakarma, which documents various references for greater authenticity. Part 3, contains eight annexures dealing with various issues. Annexure 1 contains a list of the post graduate and PhD thesis works reported in India, it gives a comprehensive idea about the scientific validation which has happened in the field of pañcakarama. Annexure 2 gives a glimpse of the specifications and descriptions of equipment and apparatus used in the therapies. The short crisp description with color photographs makes for greater visual appeal. The remaining annexures give information about the oils used in the ATC, abbreviations, comprehensive list of herbs, cūrṇa, ghṛta and tailas used in pañcakarma, bibliography, glossary of Sanskrit words and lastly the list of Sanskrit and technical terms used in the book. The book is comprehensive and complete, and the authors has made all necessary efforts to provide guidelines which are the need of the hour. There are many ATC operating worldwide, with some being authentic and some not. This book not only provides the guidelines to the ATC to conduct therapies, but also ensures the interest of serious Ayurveda practice. The emphasis and consideration of minutest detail is noteworthy. This book is a must for anyone who is planning to open an ATC or is interested in standardizing the procedures in his ATC anywhere.